Car manufacturers are putting on the brakes on developing driverless cars after several crashes. Over the past few years, the hype surrounding autonomous cars has calmed as the industry moves into a new era of cautious hope after crashes involving driverless cars and technology. 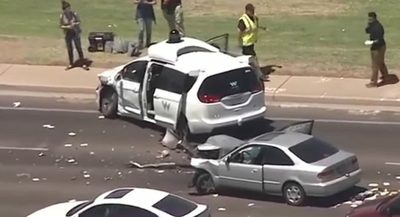 Uber Technology’s fatal crash of an autonomous vehicle “caused everyone to understand that there’s not only a long way to go technologically but from a social point of view there’s liability and brand risk,” said Gill Pratt, who leads the Toyota Research Institute, which works on driverless technology. What’s tricky is how to develop an autonomous vehicle that can safely make unprotected left-hand turns and figure out whether an idling car is double-parked. Developers sometimes approach such problems by having the robot stop or slow down, which can trigger impatience and unsafe driving from other vehicles. Americans view driverless vehicles with caution, with a recent poll showing that 75% of adults surveyed would rather drive themselves. Still, companies continue to explore autonomous vehicle options, such as Kroger using driverless cars to make deliveries.